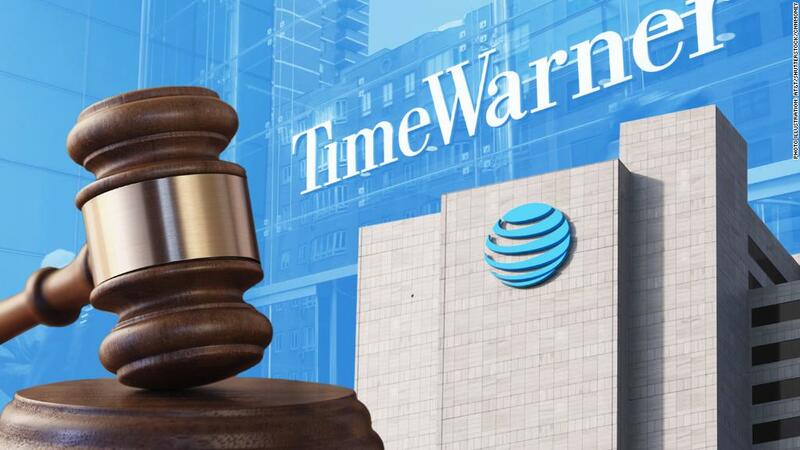 A federal judge handed AT&T a sweeping victory on Tuesday and approved its $85 billion acquisition of Time Warner, a deal that promises to reshape the media industry. After a six-week trial, Judge Richard Leon ruled that the government had failed to prove that the deal violates antitrust law, and ripped apart its case in his opinion. Using unusually strong language, he discouraged the Justice Department from asking him to put the ruling on hold while it considers an appeal. He said such a stay would be "manifestly unjust" because it would have the effect of killing the acquisition. AT&T celebrated the ruling and vowed to close the deal by June 20 — meaning that HBO, CNN, Warner Bros. and Time Warner's other brands will change hands next week. The deal will unite Time Warner's TV shows and movies with AT&T's enormous distribution system, including cell phone and satellite networks. "This was a defining case for antitrust enforcement in the US," former Justice Department antitrust attorney Ketan Jhaveri said. "It does seem to be a complete and total victory for AT&T." In a blunt statement after the ruling was issued, Time Warner (TWX) pointed the finger at President Trump, implying that he influenced the DOJ's decision to bring the case. Time Warner said the government's lawsuit was baseless, "political in its motivation," and should have never been brought. The DOJ and the White House have previously denied charges of political interference. The Justice Department's top antitrust official, Makan Delrahim, issued a sworn affidavit during the trial saying the decision to bring the case was not influenced by the White House. Trump spoke out against the deal when it was announced in October 2016. He cited the size of the combined companies. 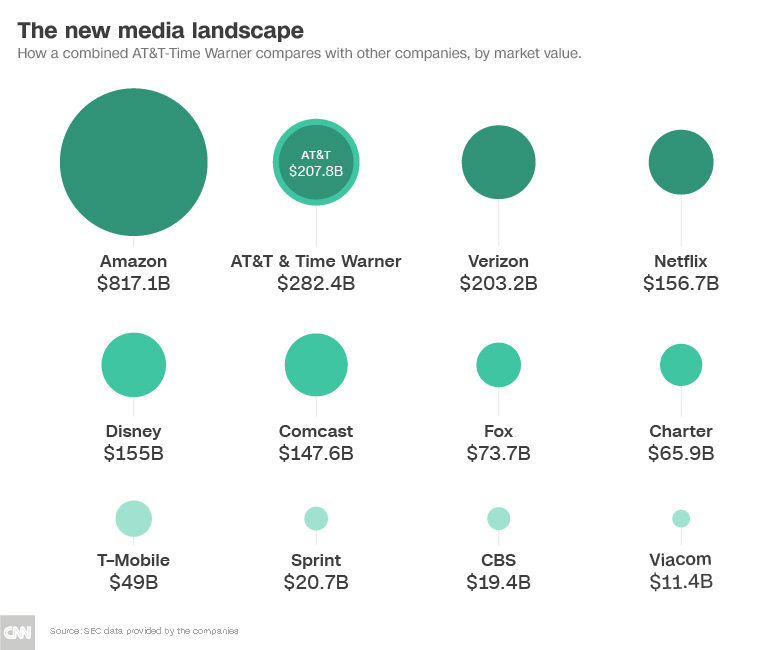 The transaction is one of the biggest in media and telecom industry history. AT&T said it needed Time Warner to survive in a rapidly changing media landscape, especially to compete against giants like Netflix and Amazon. But the antitrust division of Justice Department sued in November 2017 to stop it, arguing that the combination would harm competition and raise prices for consumers. The judge didn't buy that. He had the option of rejecting the deal outright or demanding certain conditions, including that AT&T sell some of Time Warner's assets. But he signed off on the deal with no conditions and knocked down the government's contentions point by point. "The Government has failed to meet its burden of proof to show that the merger is likely to result in a substantial lessening of competition," he wrote in his ruling. Delrahim said the government was disappointed in the ruling and would "consider next steps." "We continue to believe that the pay-TV market will be less competitive and less innovative as a result of the proposed merger between AT&T and Time Warner," he said in a statement. Daniel Petrocelli, lead attorney for AT&T and Time Warner, speaks outside the court house. AT&T and Time Warner's lead lawyer, Daniel Petrocelli, said outside the courthouse that the companies were gratified and relieved. The judge's ruling is being seen by tech and telecom giants as a green light to pursue a slew of major media acquisitions. Comcast is widely expected to bid within days for part of 21st Century Fox. (FOX) That would set up a showdown with Disney, (DIS)which has already put in a bid for those assets. Fox stock jumped more than 6% in after-hours trading following the ruling. "Brian Roberts and Team Comcast are cleared to bid," BTIG Research analyst Rich Greenfield told CNNMoney after the ruling. "The question is whether Disney is ready." A Comcast spokesperson declined to comment. The larger business world was also watching Tuesday's announcement very closely. Companies in many industries may feel more free to strike deals as a result of Leon's ruling. "It's open season for vertical mergers," said Chris Sagers, an antitrust law professor at the Cleveland-Marshall College of Law. "The fact is that they've gotten a little easier, and we'll see a big flurry of deals." Some of AT&T's top executives traveled to Washington for the announcement. Leon, living up to his old-school reputation, read part of the ruling aloud and didn't allow anyone to report the news until he finished speaking. AT&T CEO Randall Stephenson remained at company headquarters in Dallas, and he learned of the ruling when AT&T general counsel David McAtee called him, a spokesperson said. Stephenson was relieved. So was outgoing Time Warner CEO Jeff Bewkes, who also learned the news from a phone call. The deal could still be imperiled if the Justice Department convinces a circuit court to issue a stay pending appeal. But Leon's comment discouraging a stay makes that outcome seem unlikely. Otherwise, AT&T will take control of the Time Warner assets in about a week. John Stankey will become the executive in charge of the assets, succeeding Bewkes. AT&T announced plans to acquire Time Warner on October 22, 2016. That same day, Trump, then a candidate for president, pledged that his administration would block the deal. "As an example of the power structure I'm fighting, AT&T is buying Time Warner and thus CNN, a deal we will not approve in my administration because it's too much concentration of power in the hands of too few," he said. When the government sued a year later, it alleged that a combined AT&T-Time Warner would have too much leverage in negotiations with television distributors, which would hurt competitors, harm innovation and could lead to increased cable prices for consumers. AT&T and Time Warner say the combined company can leverage viewer data to make better content to sell more targeted ads, which they claim could help lower prices for consumers. Initially, the companies planned to use a "selective enforcement" defense, alleging that the administration was blocking the deal because of Trump's disdain for CNN. But Leon blocked discovery on certain White House communications that AT&T and Time Warner were seeking, and the companies dropped that defense, choosing to litigate the case on pure antitrust grounds. 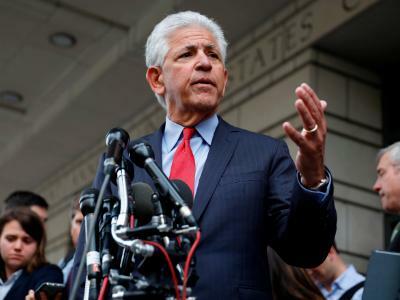 "The case stands as a testament to the wisdom of this combination of these two great companies, and how it will benefit consumers for generations to come," Petrocelli told reporters afterward. "We're disappointed that it took 18 months to get here," he added, "but we are relieved that it's finally behind us." -- CNN's David Goldman contributed reporting.